Today it is hard to imagine the fear and anxiety that the populations of the two superpowers felt after the Cuban Missile Crisis. With the buildup of each countries arsenal of nuclear missiles, insuring the concept of mutual assured destruction, both the United States and the Soviet Union teetered on the brink of annihilation in their quest to extend their political ideologies around the world. With the Soviet Union entrenched in the dogma of the Communist manifesto, debate as to the lunacy or viability of the nuclear arms race was left to the varied political factions of the United States. It is in this tense political atmosphere that the film Seven Days in May occurs. 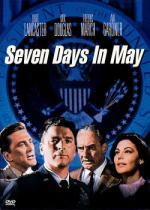 With a taut screenplay by Rod Serling and helmed by the hottest director of the time John Frankenheimer, Seven Days in May poses the question; Could a military cabal seize the power of the presidency in protest of a non-proliferation and de-armament treaty with the countries perceived enemy? Starring Burt Lancaster, Kirk Douglas and Frederic March as the antagonists in this fast paced political drama; the film centers on the uneasy alliance between politicians and military men as to the course of our country’s national defense. As leader of the Joint Chiefs of Staff, General James Mattoon Scott (Lancaster) is a staunch believer in the doctrine of ‘might makes right’. When a treaty is signed with the Russians stating that both countries will destroy their arsenals of nuclear missiles in hopes of averting another calamity similar to the one just two years prior, Scott takes steps to relieve the commander in chief, President Jordan Lyman (March) from power by forcibly taking control of the government. When a few inconsistencies and vagaries start to surface in the Pentagon, Scott’s chief adjutant, Colonel ‘Jiggs’ Casey (Douglas) becomes apprehensive about his commanders intentions, forcing him to contact the president with his suspicions. Over the course of the film the battle by both sides to stop the other is played against a timeline leading up to the coup, hence the ‘seven days’. It must have been refreshing for Serling to be able to move away from the science fiction scripts he had become famous for while making The Twilight Zone, and to sink his teeth into a story which was close to his heart. Many of the best episodes of the Zone were based on his fears of a madman pushing a button and killing us all. Now with the backing of a major motion picture studio, an all-star cast, and a prominent director, he would get his message displayed on the big screen for all to see. From beginning to end, the pacing of the plot moves in an unwavering motion towards an ending that captivates and satisfies. The only time the film stutters is when Ava Gardner is in onscreen. Once, she was the most beautiful woman in Hollywood, but the years and the troubles in her life had made her appear still somewhat attractive, but a little haggard. Her role as Ellie Holbrook appears to have been tacked on to add a little estrogen into this high charged testosterone atmosphere and she comes across as somewhat somnambular in her portrayal of the jilted mistress of General Scott. This is the one reason that I cannot give this excellent film a rating of five stars, in their effort to add balance to the cast, the producer’s predictable attempt at adding a romantic Achilles heel to Scott’s character falls flat. Setting this one little fault aside, if you are as big a fan as I am of good drama, Seven Days in May delivers the goods and I give it my highest recommendation.